The spirit of Adventure that is so much alive in the young is offered very little in our country to nourish upon and expand. Physical endeavour in close proximity of Mother Nature in all her moods is always an exhilarating experience, and life-out-of-doors cultivates all that is wholesome in us. Why then, do we deny our young people the most stimulating form of education and character development? It cannot be for lack of response from the youth, nor it is now because of inadequacy of proper know-how and organization. The Adventure Foundation of Pakistan with its fund of experience is determined to render valuable services in this cause by offering guided opportunities to the eager youth of the Pakistan. Join our programmes and go where there is fun and adventure, appreciation learn about natural environment and of course, good fellowship. 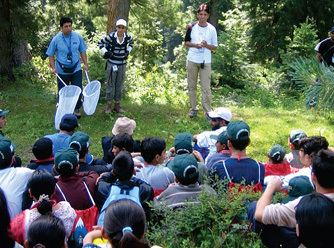 In collaboration with WWF-Pakistan, OISCA-Pakistan, GEF-SGP and UNDP Programmes, we organize weekend nature camps. These camps are designed for young children to create awareness among them about our natural heritage and to cultivate a protective attitude towards it. The activities at camp are a blend of adventure skill training, nature study work, field surveys and outdoor experience under the leadership of experienced Wilderness Guides. The experience shared in the camp will develop a sense of respect and love of nature. Open to children all aged 8-10 years. In collaboration with KPK Wildlife Department and GEFSGP Programme of UNDP, and WWF. 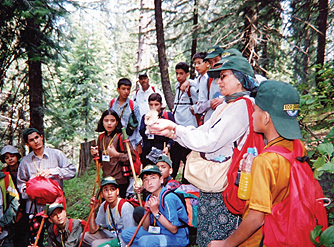 We organize nature study camps at Ayubia National Park. The camps are designed for young people to create awareness of the natural heritage and cultivate a protective attitude towards the natural environment. The activities at camp are a blend of adventure, nature study and outdoor experience that greatly benefits the young participants. All activities are supervised by highly experienced camp counsellors and resource persons. Open to children 11-14 years of age. We enter the thirty first year of our Endeavour in the field of Outdoor Education with pride of accomplishment. Although acknowledgement at the national level is as yet unattained, general awareness is much in evidence. Action oriented outdoor experience has assisted in raising awareness of the younger generation to the vital place of the natural environment in our lives. Through the young people, this will certainly pass on to the older generation in contact with them. Better to understand so much that is talked about climate change and human generated degradation of the environment in which we live. The foundation is dedicated to provide safe opportunities to discover and equip themselves with hands-on-experience of outdoor living and serve as true friends of the Earth. As they grow they will take on the responsibilities of protecting and preserving Mother Nature and her wonderful web of life that surrounds us all. We in the foundation will continue to serve our venturers who will lead us eventually towards a better future for themselves and the next generation to come. Have the life moulding adventure that you deserve and may the new year serve you with gladness. Copyright 2013 Adventure Foundation Pakistan. All Rights Reserved.